The time of year is quickly approaching when keeping pasture plants in a vegetative state is probably the hardest for forage producers. Managing pasture growth early in the growing season is important to maintain high quality and high quantity forage production throughout the spring, summer and fall. A “spring flush” occurs in cool season grasses because the optimum temperature for growth occurs and the most important nutrient, water, is readily available. Growth distribution of cool season grasses and most legumes are greatest in the spring when air temperatures are 70-85 degrees. Start moving animals through your first paddocks when soil conditions permit and the plants are a few inches tall. Rotate livestock through paddocks or fields at a pace which gives them just enough time to graze the tops off the forage. Move on to the next field and let livestock graze the same way. This will help stagger forage growth, keep more plants in a vegetative state and reduce seed head formation as the season progresses. This is a good strategy, but being able to keep ahead of grass growth when the temperatures warm and the growth explosion occurs is easier to say than it is to do. In the first rotation each spring livestock preferences are not very noticeable, but as grasses and legumes grow, livestock preferences for certain forages begin to show and uneven grazing patterns appear. Problems arise in many paddocks across Ohio because fescue is mixed with orchardgrass, bluegrass, ryegrass and clovers. If allowed, cattle will eat other grasses and clovers to the ground and leave the fescue standing. Using heavy stocking density on small paddocks at this time may help, but moving livestock frequently will be necessary to make this approach work. After the first or second week of May, in our area, if you have fescue plants that have been refused to this point, they will not likely be grazed in the next rotation or in the remainder of the summer rotations. If large amounts of un-grazed fescue persist in the paddock, clipping or bush-hogging should be considered as an option. This will stop seed-head production, reduce shading of other plants and may allow more favorable grass/legume growth in the paddock. Remember, taking proper care of the forage plants is the key to high quantity and high quality forage production throughout the year. Soil that is too wet can complicate grazing management too. When livestock repeatedly trample wet soil, the soil aggregates are broken down, and air spaces in the soil are reduced. This process is called pugging. Care should be taken so pugging does not take place over large portions of your grazing area. Severe pugging can decrease forage growth for weeks, maybe months, so fencing livestock onto a heavy use pad or using a smaller sacrifice area to feed hay in, may be the best option if conditions like this exist. Paddocks that are well drained or those that are predominantly fescue are good choices to use early. If minor pugging does occur, plant production will not decline very much. It may even boost production of clovers because opening the soil can stimulate new plant growth if viable clover seeds are present. Forages in early spring pastures are extremely lush. Plant material is only about 15% dry matter while crude protein is generally high, possibly 25-30%. Hay or supplemental feed should still be provided during the early rotations to be sure adequate dry matter is in the animal’s diet. Cattle producers, be sure to supply free choice mineral mixtures with adequate amounts of magnesium (12-14% Mg in the mineral mix) at this time of year and move the minerals along to each new paddock. This reduces chances of grass tetany in livestock that are grazing fast growing grass-dominated paddocks. As rotations continue into mid and late May, more volume of forage should be growing in each paddock. Cool season grasses attempt to reproduce in the spring by shooting seed heads. If plants are allowed to flower and set seed, the quality of forage and production may be greatly decreased the remainder of the growing season. Regulating livestock consumption in each paddock to keep grass in a vegetative state should be the manager’s objective. If legumes are the predominant species in a paddock, do not turn livestock into the forage while plants are wet. Bloat may occur. Wait until the surface moisture dries and feed hay before livestock enter these paddocks to reduce chances of bloat. It is important to look ahead and monitor forage growth in your paddocks. Often, livestock cannot utilize all the grass produced in each paddock by the second or third rotation; therefore as a manager we must make decisions of how to handle the excess grass growth. What should we do if we have extra grass accumulating in the next paddocks? Selected paddocks could be made into hay and those paddocks brought back into the rotation later, but the grass should really be cut no later than the boot stage to keep these plants in a vegetative growing state. The problem with this strategy is, if we mow paddocks when we should, to keep plants in their maximum vegetative stage, (mid May) we usually cannot get the grass dry to make the hay. Clipping or bush-hogging some forage a few days apart in early May could be advantageous, even if it cannot be baled for hay. This will keep plants vegetative and highly productive so uninterrupted rotations can continue the next time around. Many managers do however, leave those unneeded paddocks grow until haymaking weather arrives, usually June, and then make the hay from the forage that was not needed or could not be grazed at the proper height/stage. Be careful not to set aside too many paddocks if you choose this method because you may find yourself in a deficit situation for forage the correct grazing height as you make your next rotation in late June. Re-growth from set aside fields may not be ready to graze again until mid July depending on temperatures and moisture availability. Wise use of fertilizer in the spring is also an important part of pasture growth management. Do not heavily fertilize all of your pastures early in the spring. If you need more pasture early, only fertilize a few of your paddocks. Late May or early June is a better time for fertilization. This will have several benefits. First, you are not adding to the excess growth problem most managers have in the spring. Second, you will be feeding the forage plants at a time before warmer and dryer weather is about to begin. The plants can use the nutrients at this time to maximize productivity before the “summer slump” occurs in late July and August. This provides additional growth at a time when it will be needed by the livestock and quality of this forage should still be very high. The type of forage and amount of forage produced in your paddocks is directly related to your pasture management practices. Look at your paddocks and project in your mind what you think they will look like 2-3 weeks in the future based on the growing conditions. Then match your projected growth with what you actually observe at that later date. Doing this on a regular basis throughout different stages of the growing season helps one become a better grass manager. Summary: If we use our livestock to harvest the forage we want them to harvest, at the time it needs to be harvested, better forage quality will be produced and greater quantity can be generated. The plants, the animals and you will be rewarded for properly managing the “spring flush”. Posted by Braden Campbell at 10:34am August 17, 2017 Posted in Forages and Pasture and tagged Forages and Pasture, Management, Nutrition. Bookmark the permalink. 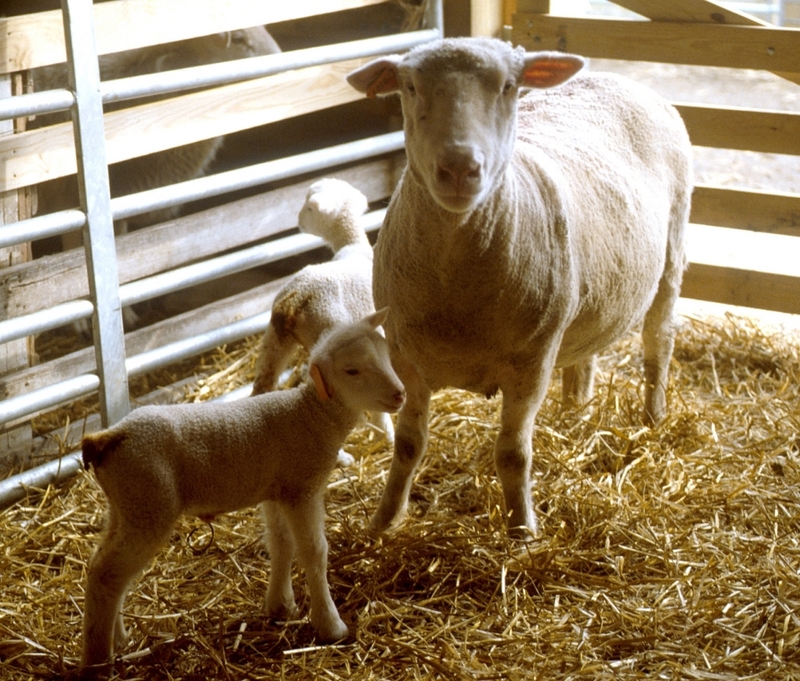 ← Interested in Finding Out How Your Lambs are Performing? Have Them Scanned!